Yes, decluttering sounds like a good idea. But where do you start and how do you make all the decisions that will open up? You can easily get stuck in a classic knowing-doing dilemma. You know you want to change, you might even know WHAT you want to change, but you just don’t know what to DO or where to START. Keeping the status quo feels safer. Well the good news is that many people have walked this path before us and have left some useful tips. Here are three powerful questions to ask in any situation where you need to clarify your position and make a decision: you want to bridge the knowing-doing-gap. WHAT? – is your chance to look objectively at the facts. You can ask more questions here to paint a full picture – What exactly is it? What exactly happened? Where did it come from? Do I like it? SO WHAT? – takes you deeper and leads you to explore what this means to you. You can ask more questions here to explore what is really going on. How do you feel about it? What assumptions are you making? What do you care about? What upsets you? What are you proud of? NOW WHAT? – here you take the information you learned from the first two questions and use it to see your situation from a different perspective. You apply your new insights to ask more questions about the bigger picture, exploring different view points. What would happen if I did nothing? What would happen if I changed . . . ? What do I contribute to this situation? Can I make a change? What needs to happen for me to . . . ? Here is a simple example from decluttering my home. I have three glass bowls from my grandmother. WHAT? are they – lustre glass, orange, old-fashioned. I don’t use them. I don’t like them very much. They have no monetary value (I checked). SO WHAT? – They remind me of my grandmother, and the times we spent together. They help me to remember her life and her qualities. I value remembering her. I loved her. NOW WHAT? – Do I need all three? Can I remember her in other ways? How would I feel if I gave them away? Next time you find yourself puzzled about how to change the things you know you need to change, try asking yourself three whats . 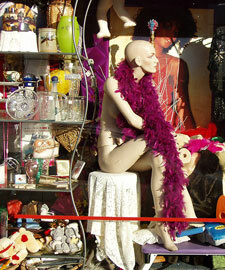 . .
As I declutter my house and my life I am a regular visitor to the Charity Shop. I have a gift-aid number with the British Heart Foundation shop – heart disease runs in my family, not cancer! Seeing items from my home displayed with a price tag is a strange experience. Seeing them remain unsold is even more strange. I come home and look at everything with fresh eyes – then ask the question . .
Is this treasure or is it junk? Here is a sample of the suggestions from Richard Swenson’s prescriptions for restoring MARGIN. In his book he talks about how problems arise in each area, then gives a full description of what you might change to make a difference. At the back he gives a comprehensive list of references and further reading – no shortage of resources for change! One or two might give you a nudge in the right direction. It is all very well decluttering your home and office, but what about the other clutter in your life? She left me no space to tell her what was actually happening in my life. Without pausing she went on to bemoan how much work and pressure we all have to cope with; long hours, phone calls, emails. In fact my life is not busy at the moment – and I have lots I could say about that. In the Apprentice Series, the next Soul Training exercise I am learning about is MARGIN. Margin refers to the space on the edge of a page where there is no text. In this context it is about leaving space in your day for leisure, rest, family, health and God. Richard Swenson is a doctor who discovered marginlessness in the lives of his patients and witnessed the stress this produced. When he realised his own life was just the same he was shocked to recognise he was compromising his health, his family and his relationship with God. The three things most important to him. He cut his medical practice in half and wrote a book – Margin; Restoring Emotional, Physical, Financial and Time Reserves to Overloaded Lives. The message is simple – just say no. But to what? To anything that is not absolutely necessary to the well-being of your soul or the welfare of others. Making changes like that takes some thought and practice . . . I bought the book. What do you think, can we declutter our lives?